Careful hands and colored bands recently marked the resurgence of endangered red-cockaded woodpeckers at Silver Lake Wildlife Management Area. Joe Burnam, a wildlife biologist with DNR’s Nongame Conservation Section, banded young woodpeckers at the WMA near Bainbridge earlier this month. Burnam had monitored the cavity nests in longleaf pines weekly since mid-April. At 5 to 10 days old, the birds were gently fished out and banded – a metallic U.S. Fish and Wildlife Service band and a color band on one leg, and three color bands on the opposite leg. Unique color combinations allow biologists to identify a bird in the wild. Burnam’s banding at Silver Lake underscored an upward trend in the only population of red-cockaded woodpeckers on state land. So far, 19 nests have been found at Silver Lake, part of 25 active red-cockaded woodpecker clusters, or family groups, on the WMA. An active cluster is a collection of trees with cavities used and defended by a single group of woodpeckers. Silver Lake had 19 active clusters when DNR acquired the 8,400 acres in 2008. Silver Lake's red-cockaded woodpeckers have benefited from biologists installing artificial nest cavities in longleaf pines – this species is the only North American woodpecker that excavates cavities in live trees – and adding birds from other sites such as at Apalachicola National Forest and Eglin Air Force Base (“Newcomers settling in at Silver Lake,” October 2010). “A couple of females we’ve moved in have paired up and are nesting this year,” Burnam said. Prescribed fire during spring and early summer also stimulates flowering and seed production of some native plants, which likely has a positive impact on insects the woodpeckers eat, as well as many other wildlife species in the longleaf ecosystem, according to Burnam. Considering that red-cockaded woodpeckers are imperiled because of habitat loss, the effort and the species’ response add up to some rich news for a very rare bird. 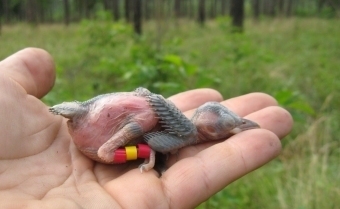 DNR also monitored red-cockaded woodpeckers this year at Moody Forest Wildlife Management Area in Appling County and banded nestlings at private Pebble Hill Plantation, a Safe Harbor participant near Thomasville. In 1999, DNR developed the nation’s first statewide Red-cockaded Woodpecker Habitat Conservation Plan to provide management options for private landowners. Now, 156,997 acres are enrolled in Safe Harbor management agreements covering more than 100 woodpecker groups, mostly in the Red Hills Region near Thomasville. Doug Hoffman admits he doesn’t sleep much during sea turtle nesting season. Protecting nests on Cumberland Island from predators like hogs, raccoons, armadillos and coyotes keeps the National Park Service biologist up most nights. But the sea turtle hat trick Hoffman witnessed May 4 made the bleary-eyed patrols even more worthwhile. Hoffman was on Cumberland’s north end when a green sea turtle emerged from the surf just after 10 p.m. She crawled to the base of the dune he was perched on and began to lay eggs. Four hours later, Hoffman spotted another turtle 100 yards away. He checked after she began laying: a loggerhead, Georgia’s primary nesting sea turtle. As she was crawling for higher ground, another turtle left the surf farther south. Hoffman also gave her time to start laying, then went closer. “Imagine my surprise when I walked up on a leatherback (sea turtle) actively digging,” he wrote. Because the three nests were below the spring high-tide line, Hoffman relocated them to higher ground the next morning to prevent any eggs being inundated by tides and lost. That evening and the next two, tides associated with a “super moon” washed out the three original nest sites. Hoffman said the leatherback nest contained 88 eggs; the green, 130; and the loggerhead, 121. Cumberland recorded its first predation of a sea turtle nest by coyotes last year. Comprehensive day and night predator management activities on the island have reduced nest predation rates from 67 percent in 2000 to less than 5 percent a year over the last 11 years. Nesting at Cumberland has been “wide open” so far this year, Hoffman said. The island scored the year’s first loggerhead nest – April 25 – and has recorded more than 80 since. The statewide total has topped 320. Click for updates. It’s not known whether the early surge will lead to a stronger season. Last year’s state count of 1,992 loggerhead nests marked the most since comprehensive surveys began in 1989. The total including leatherback and green sea turtle nests was 2,004. So far this year, 88 sea turtles had been found dead, sick or injured on Georgia beaches, continuing 2012’s unfortunate lead in strandings through the same period since at least 2007. Almost half -- 41 -- showed injuries consistent with being hit by a boat. Tips for avoiding turtles. Support conservation of sea turtles and other nongame wildlife in Georgia. Here's how. Red-cockaded woodpeckers weren’t the only rare birds banded this month. Nongame Program Manager Jim Ozier banded three peregrine falcon nestlings May 9 on SunTrust Plaza, where the raptors nest high above Atlanta (photos). Nongame staff also banded 35 wood stork chicks near St. Mary’s. logo of the local convention and visitors bureau sports “Sal the Salamander.” Why is the federally listed amphibian favored in this deep south Georgia county? Bureau Executive Director Ryan Willett explains. Eastern diamondback rattlesnakes warrant further study to determine whether the species should be protected under the federal Endangered Species Act. The U.S. Fish and Wildlife Service’s 90-day finding has triggered a comprehensive status review of these heavyweight rattlers once abundant in longleaf pine ecosystems across the Southeast (map of historic range). Thirty-one juvenile eastern indigo snakes released at Conecuh National Forest continued efforts to reestablish the federally threatened snake in an area of Alabama where it once flourished. 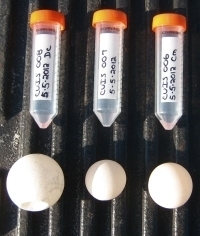 Nongame Program Manager Matt Elliott and senior wildlife biologist John Jensen helped collect the gravid indigos in Georgia that produced the young snakes. The discovery of two gravid indigos at Conecuh this year raised hopes that the re-introduction is working. More whorled sunflower sites, some with thousands of stems, have been found at Coosa Valley Prairies in Floyd County by Malcolm Hodges, state stewardship director for The Nature Conservancy. Referring to Hodges' comments about years of prescribed fire possibly spurring this plant state-listed as endangered in Georgia, Nongame botanist Tom Patrick called the discovery “one of the best stories" he has heard about fire effects and rare plants. Visitors to the Wildlife Resources Division’s Conservation Center in Social Circle can see what a Coastal Plain pitcherplant bog looks like. 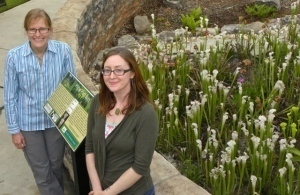 A small garden funded by TERN and organized by Carrie Radcliffe (right), mountain bog project coordinator for the Georgia Plant Conservation Alliance, and Nongame botanist Lisa Kruse (left) features pitcherplants donated by Atlanta Botanical Garden. Okefenokee National Wildlife Refuge during an aerial survey by Nongame biologists Todd Schneider and Nathan Klaus, done in cooperation with refuge staff. The cranes, a rare non-migratory subspecies that nests in wetland prairies in Florida and south Georgia, appears in decline and is a high priority for conservation. A Naples, Fla., man pleaded guilty last week to killing an endangered Florida panther in 2009. Todd Alan Benfield, 45, faces maximum penalties of up to a year in prison and a $100,000 fine for shooting the panther while bowhunting and then hiding the carcass. Names in the news: Nongame Conservation botanist Mincy Moffett Jr. wrote a comprehensive profile of Ohoopee Dunes Natural Area for The (Swainsboro) Forest-Blade’s “progress” edition. Biologist Clay George co-authored a paper that will be published in Marine Mammal Science and summarizes the disentanglement and subsequent necropsy of a juvenile right whale that died from entanglement wounds in 2011. Event updates: JAKES Day at Charlie Elliott Wildlife Center drew a crowd of more than 1,300. The Georgia Mountain BirdFest at Unicoi State Park was also a success, but the 2013 event will be held at Amicalola Falls State Park and Lodge April 25-28 because of renovations at Unicoi. Nongame Conservation had a strong role, again, in Swainsboro’s Pine Tree Festival, providing booths, a wildlife display and even hiking tours of Ohoopee Dunes Natural Area. Georgia Power played host to Southern Company’s annual Stewardship Partners Meeting, where the take-home message was the importance of public partnerships with private landowners to conserving and restoring longleaf pine ecosystems. month. One, named Postel, was recently roosting on Georgia’s Little Egg Island Bar. 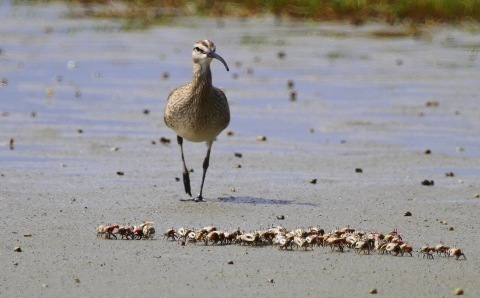 and stopover sites, including those in Georgia critical to these wide-ranging shorebirds. center of Tropical Storm Gert last summer. The Nongame Conservation Section of DNR's Wildlife Resources Division receives no state funds to conserve nongame wildlife, native plants and natural habitats. Instead, we depend on contributions, grants and fundraisers, such as the eagle and hummingbird license plates. How can you help?